‘Sidey’ is a left back who joined Lok in the summer of 2015 from Irvine Meadow. 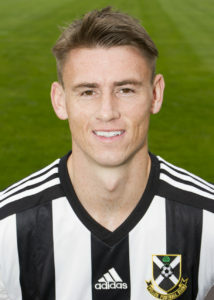 He was in the youth team of a number of senior sides early on in his career before dropping into the Juniors with Maryhill in season 2007-08. He had three years at Shotts thereafter before joining Meadow. It was announced in March 2019 that Mark had signed up again for the 2019-20 season.